For a Mass Working People Political Alternative Now! 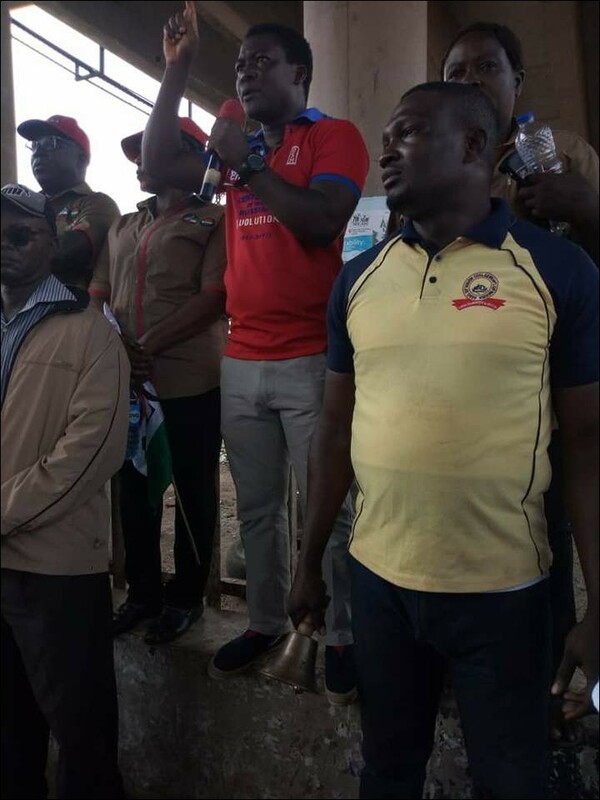 On Tuesday October 30, organized Labour held a nationwide protest to mobilise public support for its demand on a new minimum wage and the resumption on November 6 of the general strike. While the Labour leaders could have done better in term of the turnout of workers, this protest largely achieved its objective. From the reports, members of the public expressed support for the struggle. We of the DSM and SPN have consistently argued that part of the measures to win the minimum wage struggle is mobilisation of the support of other sections of the working people. It is also a welcome development that all the three Labour centres – NLC, TUC and ULC – are jointly prosecuting this minimum wage struggle. Again this is in line with the call of the DSM and SPN for united struggles of labour, despite their differences, on the basis of pro-working people programme and common interest. However we also warn against a repeat of what happened on September 30 when the struggle was suspended for nothing more than the promise that the Tripartite Committee would meet. Five weeks later we are no nearer a living minimum wage. Both the Federal Government and Governors have ignored Labour's demand while arguing amongst themselves over N24,000 or N22,500, neither of which are a minimum wage which workers can comfortably live on. 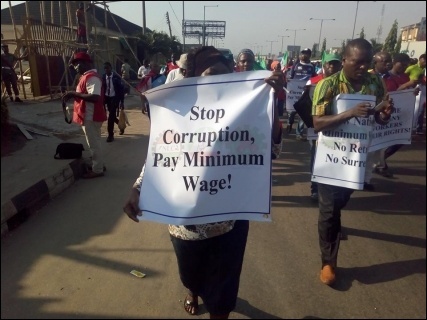 Members of the SPN actively participated in the October 30 mass protest in Abuja, Lagos, Oyo, Ogun and Osun, circulating thousands of the party's leaflet arguing for a living wage and calling for mass support for workers' demand for a higher minimum wage. 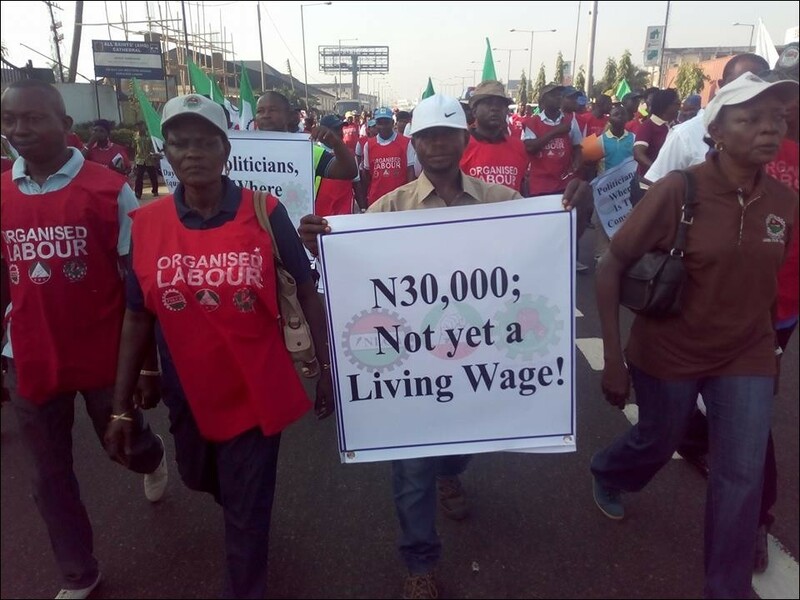 According to Labour, the Tripartite Committee of government, both federal and state, private employers and labour have agreed on N30,000 as the new minimum wage. This means that the Labour leaders have significantly climbed down from their original figure of the N66,500. Despite this, the federal government through the Minister of Labour disagreed claiming that there was no such agreement and further argued that the federal government could only offer N24,000. This position is considered fraudulent and a misrepresentation of the outcome of the meeting. On their part, the state governors have argued that the could only pay N22,500, citing the inability of states to even pay N18,000. Unfortunately, it was the failure of Labour leadership to force the state governments to truly implement the current minimum wage since 2011 that has armed the state governors with this fraudulent argument. In reaction to the failure of the state and federal governments to honour the tripartite committee agreement, the labour leadership have threatened to go back to their original demand of N66,500 which will be pressed at the strike starting on November 6. The demand for N66,500 should not be a mere bargaining chip for N30,000. Rather, Labour should mobilise workers and the masses around it if they truly believe that this figure fits the bill given the cost of living. It can be won if they are ready to struggle for it. The fact is that as far back as December 2008, nearly 10 years ago, Labour first demanded N52,200, something that is much higher than N30,000 the Labour leaders have agreed to in the current minimum wage negotiation. So given the high rate of inflation especially following a series of devaluations of naira and fuel price hikes since 2011, N66,500 minimum wage currently would be lower in value than N52,200 in 2009. In any case, the fact is whatever figure Labour agrees to, it will require a series of mass actions to win the demand. We therefore welcome Labour's decision to embark on strike action on Tuesday November 6 despite the kangaroo court injunction secured by the anti-poor Buhari government against the planned action. They should go ahead with the strike if the meeting the government has called for this Sunday and Monday does not agree to the labour demand. However, instead of immediately calling an indefinite action we propose a 3-day or 4-day strike as the next step, following which the action could be suspended to evaluate the response of the government with a view of resuming it if the demand is not met. Any pause in strike action must be utilised to maintain mobilisation and support for subsequent rounds of strikes. Such mobilisation would also keep the pressure on the Labour leadership not to agree any rotten compromise. A key part of any successful strike would be the organisation of issues like the opening markets at set times, to ensure the provision of regular supplies of food etc. to limit any weariness and possible negative impact of strike on the public that could undermine its support. The fact is that with the strike, if it is well mobilised for, workers would have demonstrated their resolve and capacity to fight for their demands and thereby strengthen the bargaining power of the labour leadership. More so, given the growing groundswell of anger against the failures of the Buhari regime, a well fought strike by Labour could have the potential of strengthening the resolve of other layers of the oppressed class to fight the regime. The reality is that, since its inception, the Buhari regime has not faced any strong mass movement even though tension and anger are at breaking point. A well fought strike which humbles the regime can break open the dam of discontent with thousands gaining the confidence to fight for their demands. This apparently is why the regime is fighting hard to prevent the strike from going on. In fact, even as we write on the eve of the strike, a last minute concession cannot be ruled out in order to make the Labour leadership suspend the action. We of the DSM would reiterate that the call on Labour leadership, trade union activists and rank and file workers to boldly include the demand for the payment of all arrears of salaries and pension in the current minimum wage struggle. They must also ensure that the agreement to pay a new minimum wage includes a definite timeline for payment and the clause that no worker should lose their job on the account of the new wage. Otherwise the regime can easily agree to pay in order to look good for the forthcoming general elections and then turn around after to default. We also call on workers, youth and the masses not to buy the fraudulent argument of the government that the payment of the new minimum wage would prevent provision of social infrastructure and services like road, education and health care. What the elements in government don't want to let go is the money available for looting and their opulent lifestyle. If the jumbo salaries and allowances including security votes of the top government functionaries are scrapped and the work departments are well equipped and democratically run to carry out projects instead of fraudulent contract system, all linked to a socialist plan of the economy, there would be enough resources to begin paying a living wage and, at the same time, to start to adequately provide social infrastructures. However, none of the pro-capitalist parties – APC, PDP, APGA, etc. – can carry out such measures. This is one of the reasons we have consistently called on the labour leadership and mass organizations to form a mass working peoples party with a socialist programme or massively mobilise workers, youths and the masses to join the Socialist Party of Nigeria (SPN) in order to build it as a mass party formidable enough to wrest power from the thriving ruling elite at all levels with a view of forming a working people government on a socialist programme. Nevertheless, in the meantime, the steadfastness of labour leadership and workers in the current struggle could the force these anti-poor governments to grant the minimum wage demand. It however means that the leadership of labour cannot go to bed after winning the new minimum wage, as the recent experience, has shown it would require another round of struggle to enforce implementation of the agreement. Workers and the poor masses should also dismiss the fallacy supported with voodoo economics that an increase in the minimum wage will lead to inflation, in the medium term this is only true if the capitalists are allowed to continue running the economy. The fact is that it is the failure of the government to provide social infrastructure like road, power, education, health care, etc. together with capitalist economic policies like naira devaluation and hike in fuel prices that lead to inflation and erode purchasing power of the working people. In other words, contrary to increasing the inflation, the wage increase is an attempt to close gap with the already high inflation, to which the new wage cannot even match up. Again, this ultimately underscores the need for a working peoples' political and economic alternative that will guarantee the use of human and material resources of the country for the benefit of the vast majority.